We often hear the same statement from our clients: “I don’t know why I waited so long to call you!” Because Arkansas has a three year statute of limitations on legal action following a car accident, the longer you wait to seek help from a lawyer, the more difficult it is to get the settlement you deserve. Why do so many people wait to call for help? Often they’re simply not sure whether their case warrants hiring a lawyer. It’s an excellent question: How do you know whether to call a lawyer after a car wreck? You’re unsure about the settlement value of your case. You’re unfamiliar with negotiating with an insurance adjuster. 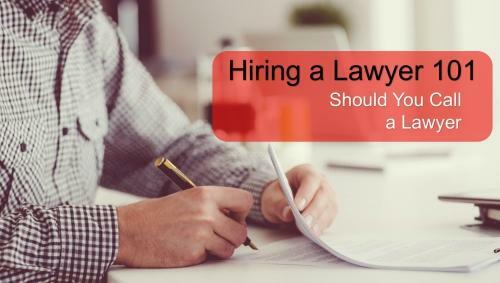 You’d like an expert to review paperwork or forms before you sign them. You aren’t clear on your legal rights in Arkansas. There’s clear liability – the other driver has taken full responsibility and has acknowledged it to both insurance companies. You have no injuries, or your injuries are very minor and have completely healed within weeks. You have very low or no medical bills. There are no complications that require further investigation, like pre-existing injuries, questions about insurance coverage, issues with the Arkansas statute of limitations, or complex circumstances surrounding the accident. Unfortunately, car wrecks are rarely as simple as the “Green Light” situation described above. Even low-speed collisions can cause significant property damage and nagging soft-tissue injuries. Insurance adjusters rarely offer full compensation. At-fault drivers may be uninsured or underinsured, making it difficult to recover your damages without the help of a skilled lawyer. It’s important to remember that insurance adjusters do not work for you. Insurance companies are businesses, and they benefit from giving you the lowest possible settlement. Statistics show that on average, people receive higher settlements when they are represented by an attorney. Personal injury attorneys are experienced negotiators. Their job is to protect your best interest and stand firm against unfair insurance practices. If you or someone you love has experienced accident-related injuries, don’t gamble with your health and financial stability. Call a trusted, experienced Arkansas attorney like Taylor King. He will consider the facts and details of your unique situation and give you a free, no-obligation consultation. Get started today by calling 1-800-CAR-WRECK (227-9732). You can also submit a case request at www.taylorkinglaw.com, and we’ll call you. At Taylor King Law, we’re on your side, by your side.